The Bayshore Marathon has become a “must run” for runners throughout the Midwest and beyond. Many runners return year after year to enjoy the scenic courses which run along the shores of beautiful Grand Traverse Bay. 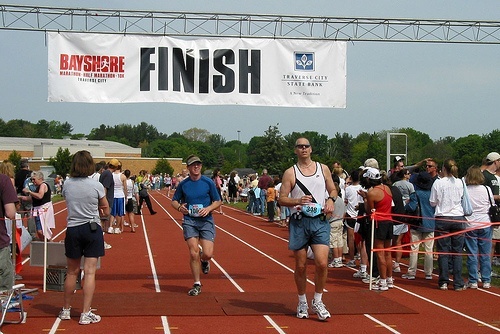 Hosted by Traverse City Track Club, Bayshore features a 10K, half marathon and full marathon. The number of runners in all three races is limited to ensure a more enjoyable experience. Bayshore is a flat, out and back course that runs along the shores of Grand Traverse Bay. Throughout the race, you have the crystal blue waters of Lake Michigan on one side and Traverse City’s famous cherry trees and orchards on the other. The course begins on the campus of Northwestern Michigan College. On your return trip you return to the Start Line, and then step onto a track for the final quarter mile inside the stadium. The only ‘rise’ on the course falls between the 18 and 19 mile markers. The Half Marathon course starts near the turn around point of the Marathon course and follows the same route as the marathon back to the finish line. The 10K course is just like the marathon course except that it turns around at 3 miles instead of 13 miles. The finish line will close at 1:15PM. Anyone finishing after this time (6 hours for the Marathon) may not receive an official finish time. Center Road reopens at 1:00 PM. Center Road is at mile 20 1/2 to 22 on the Marathon return. The Bayshore Marathon (MI15020SH) is one of the top Boston Marathon qualifying races according to the Boston athletic Association. Bayshore is known for its flat, fast, and scenic course. The average high temperature is 69 degrees and average low is 45.